All week the excitement builds because this weekend we will celebrate our 25-50 and 60 year Jubilarians with a community dinner Friday night and a large public celebration Saturday. The festivities spill over into Sunday as many guests stay the weekend and the liturgy planners make Sunday's liturgy a part of the jubilee time. 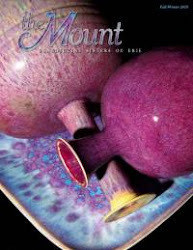 Profiles of the seven sisters can be found in this issue of the Mount magazine beginning on page 11: Sisters Judith, Mary Lou, Audrey, Rose Ann, Patricia, Miriam and Marlene. They are all great women---Enjoy! A hidden rock garden at St. Meinrad Archabbey.